Yes, it’s that time of year again: the Percona Live Europe Conference is just around the corner. And we’ll be broadcasting live from the Emerald Isle! Quite literally, since we’re planning to be on our Twitter and Facebook channels during the course of the conference, so do make sure to tune in (if you’re not attending in person). And this year’s location is indeed Dublin, Ireland, so expect lots of banter and a bit of craic. Ashraf Sharif, Senior Support Engineer will be talking about MySQL on Docker and containerised dolphins (which only sounds like a good idea in the database world). Krzysztof Książek, Senior Support Engineer, will share his knowledge and experience on all things MySQL load balancing. 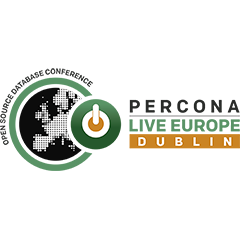 And Ruairí Newman, also Senior Support Engineer, will be discussing what some of the main considerations are to think through when looking at automating and managing MongoDB - including a closer look at MongoDB Ops Manager and ClusterControl. And since we don’t solely employ Senior Support Engineers at Severalnines, you’ll be pleased to know that Andrada Enache, Sales Manager, and myself will also be present to talk open source database management with ClusterControl at our booth. This year’s conference agenda looks pretty exciting overall with a wide enough range of topics, so there’ll be something of interest for every open source database aficionado out there.